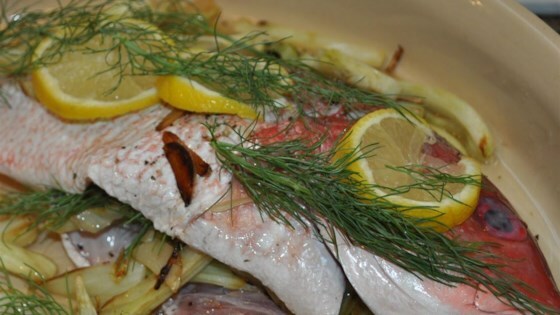 "Succulent and tender baked snapper with all your favorite ingredients, garlic, shallots, fennel and white wine." Preheat an oven to 300 degrees F (150 degrees C). Spray a 9x13 inch baking dish with cooking spray. Heat 4 tablespoons of olive oil in a skillet over medium heat. Stir in 3 cloves minced garlic, fennel, and minced shallot. Cook and stir until the fennel has begun to soften, about 5 minutes. Remove from heat. Transfer vegetables to a bowl, and stir in chopped parsley. Reserve cooking oil. Season the fish all over with salt and pepper to taste, then stuff snapper with fennel mixture. Use kitchen twine to tie the snapper together in three places. Place the snapper into the prepared baking dish, drizzle with the white wine, lemon juice, and reserved oil. Sprinkle with 3 tablespoons of garlic. Bake in the preheated oven until the fish is no longer translucent, and flakes easily with a fork, about 20 minutes. Only okay. It was very subtle, needed lots of salt, had to increase the cooking time from 20 to 25 minutes. Not a keeper for me. Delicious. Followed recipe with no changes. The fennel adds a great flavor to fish. I’ve made it now several times. You won’t be disappointed . My first time cooking whole red snapper and it was phenomenally delicious!